This large 400-year-old cheese market located on the Waagplein ("weighing square") now opens every Friday morning between 10 am and 12:30 pm from the first Friday in April until the first Friday in September. From opening ceremonies to final load, market activities are explained in Dutch, German, English, and Spanish or French (sometimes even Japanese). 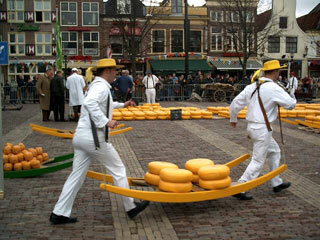 This article uses material from the Wikipedia article "Alkmaar Cheese Market", which is released under the Creative Commons Attribution-Share-Alike 3.0 License.